In the course of designing and building thousands of projects, we have developed a five-step in engineering process to maximize performance while minimizing cost and time. Every project kicks off with a formalized intake procedure to define objectives, specifications, and deliverables. We develop a detailed project plan with budget and schedule, and apply best practices in program management to ensure that we stay on target. The engineering process starts with input from both the customer and the entire team of engineers, both electrical and mechanical. They determine the line of attack, including whether it aligns with our previous experience or whether we need a clean-sheet design. We may even recommend bringing in outside vendors. 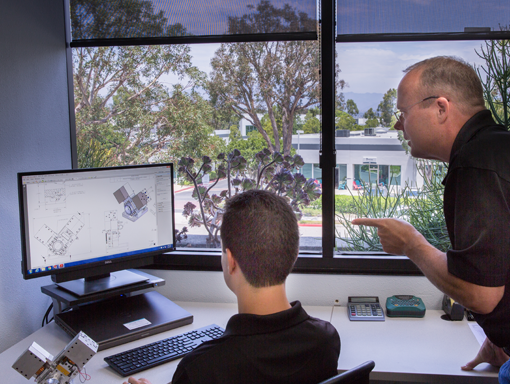 Our engineering staff applies techniques like solid modeling and finite-element analysis (FEA) to optimize performance. Industry best practices such as tolerance analysis and risk analysis ensure that the results perform to expectations. In collaboration with the customer, we develop comprehensive testing protocols. This ensures that all manufactured devices perform to specifications. Deliverables vary but can include schematics and plans, solid models, engineering analysis summaries, prototypes, and bills of materials. We understand that your intellectual property is one of your most valuable assets. We have procedures built around safeguarding your IP. We put two-way nondisclosure agreements (NDAs) into place with any project. When work begins, it takes place in a designated area with controlled access such that only approved engineers and technicians can see the information. Developing economical, high performance motion systems can be both complex and time-consuming. At Motion Solutions, we’ve had decades of experience to refine our process. By combining established techniques with proven solutions and experienced staff, we can help you efficiently achieve your project goals, whether that involves performance, cost, lifetime, or all of the above. Get better products to market faster⎯call Motion Solutions.